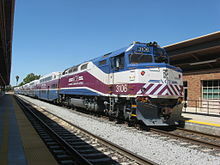 The Altamont Corridor Express (also known as ACE, formerly Altamont Commuter Express) is a commuter rail service in California, connecting Stockton and San Jose. ACE is named for the Altamont Pass, through which it runs. Service is managed by the San Joaquin Regional Rail Commission, and operations are contracted to Herzog Transit Services, using AAR assigned reporting mark HTSX. The 86-mile (138 km) route includes ten stops, with travel time about 2 hours and 12 minutes end-to-end. The tracks are owned by Union Pacific Railroad. ACE uses Bombardier BiLevel Coaches and MPI F40PH-3C locomotives. Service began on October 19, 1998, with two weekday round trips. A third round trip was added in May 2001, followed by a fourth round trip in October 2012. As of 2018 [update], average weekday ridership is 5,900. Under the ACEforward program, a number of improvements to the service are being considered. These include a rerouted line through Tracy, an extension to Modesto and Merced, and connections to BART at Union City and Tri-Valley. ACE service to Santa Clara station began in 2001, was suspended in 2005, and returned in 2012. In March 2014, ACE opened a $65 million, 121,000 square feet (11,200 m2) maintenance facility in Stockton. On July 1, 2015, management and governance of the San Joaquin passed from Caltrans to the new San Joaquin Joint Powers Authority. The SJJPA has nominal control over the SJRRC, but delegates all responsibility over ACE to the SJRRC. Also to be studied were possible connections with BART at Union City or Livermore   via traditional ACE rail, diesel multiple units, or bus bridges. This connection is likely to be facilitated by the Tri-Valley-San Joaquin Valley Regional Rail Authority. East of Pleasanton and Livermore, the line runs through the Altamont Pass on the original Feather River Route. After crossing the California Aqueduct and the Delta-Mendota Canal into the Central Valley, skirting the southern edge of Tracy. It then turns north between Lathrop and Manteca and runs to Robert J. Cabral Station in Stockton. ACE tickets are available at select stations and on ACE's web site. Distance-based fares are available in one way, round trip, 20 trip, weekly, and monthly passes. ACE operates push-pull trains with a single diesel locomotive and six or seven bilevel coach cars. Trains typically operate with the locomotive leading westbound and the cab car leading eastbound. Bombardier BiLevel Cab Car 9 3301-3309 3309 wrecked in Sunol mudslide derailment on March 7, 2016. ^ a b "Transit Ridership Report: Second Quarter 2018" (PDF). American Public Transportation Association. August 24, 2018. ^ a b c d "ACE expansion report released". Tracy Press. May 31, 2017. Retrieved June 2, 2017. ^ a b c d e f "History of ACE". San Joaquin Joint Powers Authority. ^ a b Solomon, Brian (2013). North American Railroad Family Trees : An Infographic History of the Industry's Mergers and Evolution. Minneapolis, MN: Voyageur Press. p. 127. ISBN 978-0760344880. ^ "AAR Railroad Reporting Marks (2015)". Railserve. Retrieved June 28, 2016. ^ a b c "Altamont Corridor Express (ACE)". BayRail Alliance. ^ a b "Measure K". San Joaquin Council of Governments. ^ "2014-2015 WORK PROGRAM & BUDGET" (PDF). San Joaquin Regional Rail Commission. June 6, 2014. p. 6. ^ a b Van Hattem, Matt (June 30, 2006). "Altamont Commuter Express: The commuter rail service linking San Jose and Stockton, Calif". Trains Magazine. Retrieved August 23, 2006. ^ a b c d e Cox, Jeremiah (July 10, 2013). "Altamont Commuter Express on the SubwayNut". Subway Nut. ^ "History". San Joaquin Regional Rail Commission. Archived from the original on May 11, 2000. ^ Cabanatuan, Michael (November 16, 1999). "ACE to Add Third Morning Train / Pleasanton-to-San Jose service will begin by Feb. 15". San Francisco Chronicle. Retrieved August 29, 2016. ^ a b White, Mike (March 12, 2001). "4th Ace train to bolster the fleet". Press Herald. Archived from the original on November 8, 2001 – via San Joaquin Regional Rail Commission. ^ Bott, Fran (March 1, 2001). "Third ACE train ready to roll". The Record. Archived from the original on November 8, 2001 – via San Joaquin Regional Rail Commission. ^ "Schedule Changes will be effective August 1, 2005" (PDF). San Joaquin Regional Rail Commission. August 1, 2005. Archived from the original (PDF) on November 26, 2005. ^ "SJRRC Refreshes ACE Brand with new Logo" (Press release). San Joaquin Regional Rail Commission. December 10, 2012 – via Mass Transit Magazine. ^ Rembulat, Vince (March 23, 2014). "ACE opens $65M state-of-art facility". Merced Bulletin. Retrieved August 29, 2016. ^ Sheehan, Tim (June 26, 2015). "Valley agency takes control of Amtrak San Joaquin trains". Fresno Bee. Retrieved August 29, 2016. ^ "Fallen Tree Derails Train in California; At Least 9 Injured". New York Times. Retrieved March 8, 2016. ^ Tucker, Jill; Lyons, Jenna; Cabanatuan, Michael. "14 hurt as commuter train derails -- no ACE service Tuesday". SFGate. Retrieved March 8, 2016. ^ "Executive Summary" (PDF). ACE Rail. ACE. Retrieved 2 June 2017. ^ "Chapter 2 2 Description of Phase I Improvements" (PDF). ACErail. ACE. Retrieved 28 April 2018. ^ "HERE COME THE TRAINS". Manteca Bulletin. 27 April 2018. Retrieved 28 April 2018. ^ Johnson, Zachary K. (November 13, 2009). "'Super ACE' rail project touted". Modesto Bee. Retrieved August 22, 2016. ^ "NOTICE OF PREPARATION OF AN ENVIRONMENTAL IMPACT REPORT". San Joaquin Regional Rail Commission. June 24, 2013. ^ a b "Executive Summary" (PDF). ACE Rail. ACE. Retrieved June 2, 2017. ^ "ACEforward Alternatives Analysis and Development (presentation at SJRRC Board Meeting)" (PDF). San Joaquin Regional Rail Commission. April 4, 2014. ^ "ACEforward – Improving the Altamont Corridor Express" (PDF). San Joaquin Regional Rail Commission. July 2015. ^ Wanek-Libman, Mischa (January 31, 2018). "California rail providers receive $52M in state funding". RT&S. Retrieved February 2, 2018. ^ Holland, John (April 27, 2018). "Expanded train service coming to Modesto, Merced; what it means for commuters". Modesto Bee. Retrieved April 28, 2018. ^ Vaughn, Danielle (February 8, 2017). "San Joaquin rail service plans expansion of Sacramento route". Lodi News-Sentinel. Retrieved February 14, 2017. ^ "NOTICE OF PREPARATION OF AN ENVIRONMENTAL IMPACT REPORT: ACE Extension Lathrop to Ceres/Merced" (PDF). San Joaquin Regional Rail Commission. January 10, 2018. ^ "ACE Extension Lathrop to Ceres/Merced Draft EIR Executive Summary ES.3.1.2 Operation and Maintenance" (PDF). San Joaquin Regional Rail Commission. Retrieved January 14, 2019. ^ "Getting You There". San Joaquin Joint Powers Authority. Retrieved August 23, 2016. ^ "SUPPLEMENTAL NOTICE OF PREPARATION OF AN ENVIRONMENTAL IMPACT REPORT: ACEforward – Notice of Additional Project Element – Niles Junction Connections" (PDF). San Joaquin Regional Rail Commission. May 9, 2016. p. 8. ^ Luna, Henry J.; The Pacific Locomotive Association (2005). Niles Canyon Railways. Charleston, SC: Arcadia. ISBN 978-0738529837. ^ "Altamont Corridor Express orders Charger locomotives". Trains Magazine. April 26, 2018. Retrieved April 27, 2018. Wikimedia Commons has media related to Altamont Corridor Express.